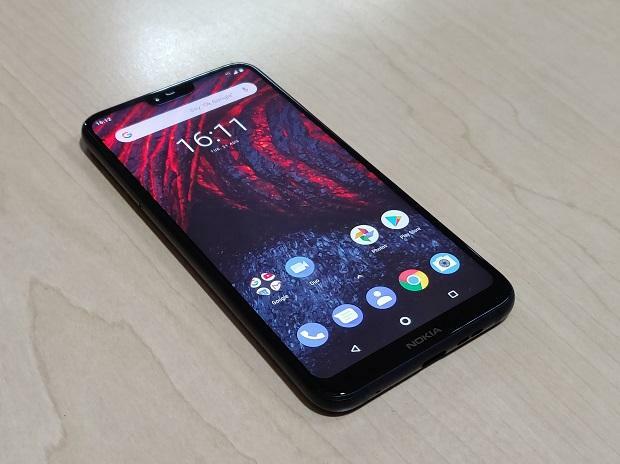 The Nokia 6.1 Plus, a first notch-based budget offering from the stable of HMD Global, is going on sale today (August 30) for the first time in India. Priced at Rs 15,999, the Android One smartphone will be available exclusively on Flipkart and the sale would begin at 12 noon on the e-commerce platform and Nokia online store. The Nokia 6.1 Plus will be available in three colour options - gloss black, gloss white and gloss midnight blue. As for the launch offer, the company is offering Rs 1,800 instant cashback and 240GB of mobile data valid for 12 months to Airtel customers on Rs 199, Rs 249 and Rs 448 plans. Compared to the predecessor, the Nokia 6.1, the Plus edition is although cheaper but offers better hardware, premium design, bigger screen estate and enhanced camera modules. In terms of design, the Nokia 6.1 Plus looks plush in its glossy outlook. It features a glass-metal-glass design in a compact form factor, which is easy to hold and operate. The phone is light in weight which makes it easy to use and carry around in hand or pocket. It is among the few few smartphones with a perfect body size -- neither big nor small. Granular detailing in design, such as silver accent lining around keys and fingerprint sensor, also accentuates its overall premium appeal. The phone has a 5.8-inch fullHD+ notch-based screen stretched in a 19:9 aspect ratio. The screen is covered with a curved Gorilla Glass 3 for protection against accidental scratches. Though the protective glass is not from Corning’s latest breed, it is still sturdy and protects the screen surface from day-to-day damage from coins, keys and other pointed items. Nokia 6.1 Plus In terms of display quality, it is a bright unit that makes it legible under bright sunny conditions. However, the contrast ratio and the colour output is not up to the mark. The black looks greyish and the colours show a shift in contrast when looked at from angles. At times, the touch above the screen also fails to recognise input. It could be a software glitch, but the failed attempt certainly diminishes the phone’s overall utility. The phone is powered by Qualcomm Snapdragon 636 system-on-chip (SoC), mated with 4GB of RAM and 64GB of storage, expandable up to 400GB using microSD card slot. The phone boots Android Oreo, and, being an Android One smartphone, it will get the Android Pie soon. The phone runs stock Android with minor customisations to improve the user experience. The user interface is sleek and the phone shows no signs of lag or slowing down. It manages multiple apps in background without forcefully closing any, showing good RAM optimisation at software levels. The phone handles day-to-day operations such as browsing the internet, watching videos, accessing social media platforms, messaging and calling with ease. It, however, shows signs of weakness while managing processor- and graphic-intensive apps such as games, video editing tools, video recording and playback, etc. The phone sports a dual camera module on the back, featuring a 16-megapixel primary sensor mated with a 5MP depth-sensing lens, and a 16MP selfie unit on the front. Imaging is the only area where the phone does not stand true to the specifications on paper. Both the rear and front cameras work optimally in daylight conditions. However, in lowlight they struggle to fix focus and to capture details. Considering the price segment, the overall camera output is satisfactory. However, with the addition of the bothie mode, which allows both the front and back cameras to work simultaneously to capture or record, portrait mode and HDR mode leave a lot to explore and experiment. The phone is powered by a 3,060 mAh battery, which keeps the show going for almost a day. The phone also supports quick charging. However, it still takes almost two hours to fill up a completely exhausted battery to 100 per cent. Importantly, the phone features a USB type-C port for charging and data transfer jobs, and features a dedicated 3.5mm audio output port, which is a welcome feature, considering that most phones are losing it just to bring down the waist size. The Nokia 6.1 Plus is one of the most balanced budget mid-range smartphones. It ticks almost all the right boxes and shows some strengths in all areas. The phone’s stock Android user interface, coupled with the dual camera module on the back, loaded with different modes and premium glass design in a compact form factor, makes it a feature-rich proposition in the sub-Rs 16,000 mid-range segment.